Sonia Gandhi came to Kokrajhar to heal the wound of the conflict that erupted in between indigenous inhabitants of Assam and mainly Bengali Muslim settlers, who are being illegal economic migrants is an open secret who have been settled in Assam by hook or by crook, at the behest of her Congress Party. She must have heard the Quo Vadis (Where are thou) cry of the settlers and came running to lend her shoulder to cry upon. It was her mother-in-law Indira followed by husband Rajib who have been willing parties to these aliens wanting to make Assam their home due to economic on the surface, but, actually for religious expansionism and making Assam a Muslim majority land where Islam can establish its rule making the indigenous tribes and non-tribes Jijiya paying Dhimmis who refuses to be converted to Islam. (Quran Verse 9:29Surat At-Tawbah (The Repentance) – سورة التوبة). Sonia being a Roman Catholic no doubt aware of the purpose and needs of the crusades in general and victory of Don John of Austria who defeated to Muslims in 1571 following 699 years of occupation of parts of the Roman Empire. Despite the three crusades Muslims have the unshakable belief on their Allah to push ahead in modern times to fulfill a prophecy,”Are they waiting for anything except the Hour to come to them suddenly? But its Signs have already come!” (Al-Quran, 47:18) (As one of these signs, Imam Ahmad reports in his Musnad that Abdullah bin Amr bin Al-‘As (ra) mentioned: “Whilst we were around the Prophet (saw) writing he was asked, ‘Which of the two cities will be opened first, Constantinople or Rome?’ He (the Prophet Muhammad) answered, ‘The city of Heraclius will be opened first! '”) The modern day Muslims have not given up on re-conquering Rome as seen in England from them holding a conference on 10 April 2010 Islam in Italy Fulfilling the Prophecy in East London, England (Ref. here ). Why is her heartache towards Muslim then? Is she bent upon following the foot steps of Mamata Bannerjee, a Brahmin despised by Muslims, showing her submission to Islam by doing Namaz like a Muslim women to win an election ONLY to fulfil her megalomaniac dream of being India’s Iron lady cynically being called of late as Didi-Giri? 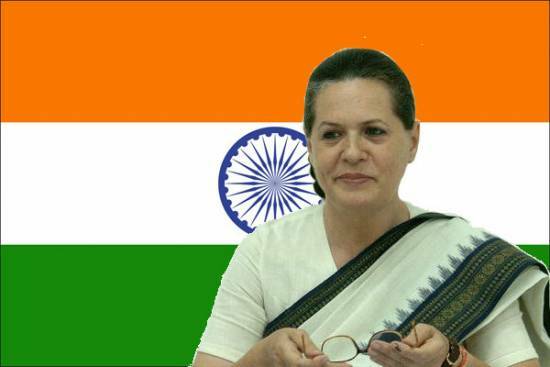 Although Sari worn Sonia may have lost some of her Italian feistiness, we of course know who was India’s REAL Iron Lady! Sonia’s mannerism has all the hall mark of imitating her mother- in-law; who was pronounced Mother India by none other than one of my vain Assamese so-called aristocrat Deva Kanta Barua saying, “Indira is India” from the president’s Chair of the Indian Congress. Coming to the point, knowing that she was married to someone who was a Muslim (he could not have been an apostate as apostasy is not allowed in Islam) having children from him, I wonder if Sonia feels soft hearted towards Muslim is general and even does not mind being an appeaser and that was her main mission in visiting Assam the other day. Gleaning news reports on recent ugly events in Assam, I note that the Christian Monitor is quite clear that it is the illegal migrants who are the root cause of the problem. Take note that out of the simple indigenous people of Assam, Bodos mainly being at the receiving end at present; my perception is that rest of the indigenous tribes and the non tribes of Assam face the wrath of few millions of East Pakistan reborn as Bangladeshi nationals who are guests of India arriving without invitation and being protected by the Indian establishment and their existence is not being acknowledged by Bangladesh authorities; who saves Assam and her indigenous peoples now? Is 7th century Sicilain occupation being repeated in Assam with Sonia’s full knowledge? If there is a savior, Quo Vadis!